Save the underworld from a familiar foe! Speak to Zimberfizz in the Soul Wars lobby. To begin, speak with Zimberfizz at the Soul Wars lobby. 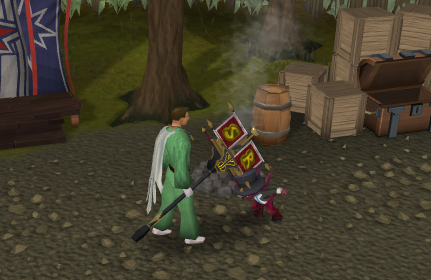 The Soul Wars lobby can be found by entering the portal near the Edgeville Yew Trees. Zimberfizz will tell you something is wrong with the Soul Altars and needs you to check on it. Investigate the nearby tent and you will find yourself in front of the altar. Investigate the altar, the crystals west of the altar, the strange emissions coming from a section of the floor. Now investigate the sticky goo a few squares south of the crystals and through a weird series of events you will find yourself in Death's residence, with Icthlarin. They will tell you that Nomad is absorbing souls in the Underworld and he must be stopped. Head through Death's door and embark on the Dusty Jetty to the north. You should find yourself in an afterlife version of Lumbridge. If you have completed Blood Runs Deep, you should find the spouse you married in the Throne of Miscellania. You may speak to him/her if you wish. 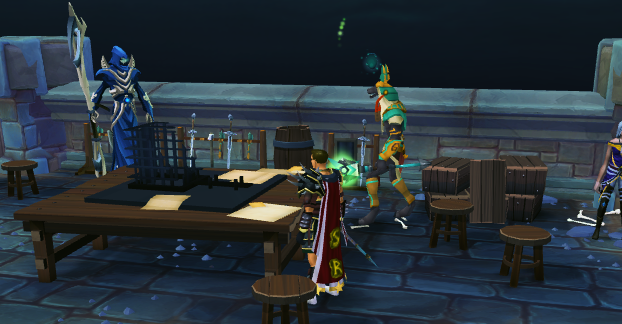 Now speak to Xenia in the Lumbridge dining room. She will be confused as to who she is. Climb up two staircases and open up the chest. This will release a level 98 Shame, which you should kill. Shame will drop a key which you can use to open the chest. Search this chest for an incomplete memory half. Now climb down another floor and open the chest in the room the Duke of Lumbridge normally would be. Search this chest for another memory half. Use these two together to get a Xenia memory. Talk to Xenia and she will be restored. Now head outside of the castle and speak to Korasi/Jessica (who it is depends on your choices in the Void Stares Back). She mutters that she needs a reason to remember herself. Head back into the castle and speak with Wizard Grayzag on the south lawn. Tell him you are Korasi/Jessica, choose the "Wizard Grayzag?" option, and then tell Grayzag you are not afraid. After this you should have a half memory. Now head up the southern watchtower and speak to Jessica/Korasi, who will give you the second memory half. Combine these and talk to Korasi/Jessica again. Now, speak to Hazelmere. Hazelmere will morph into a younger version of himself. Speak to this Hazelmere and then the Hazelmere on the top of the Castle, and next on the top of the watchtower, then Bob's Axes, then behind the castle, and finally in front of the castle. He will agree to aid you in your fight against Nomad. You are now finished with Limbo. Click on the war table. Death will tell you that the leader of the ascension members has been captured. He will ask you to interrogate him. Generally, you should threaten and/or charm the legio until you get his willpower several points down. The effect of the charm/threaten option is somewhat random, but usually it decreases either sanity or willpower. If necessary, remove crystals from him to show you mean business. There will also be several random options that take place, such as "Ravensworn handshake" as the legio's condition changes. Using Xenia and Zanik is not necessary. When his willpower and/or sanity is down significantly, ask him everything about Nomad. When you are done, you can kill him or spare him. Now you will need to set up your team. Various combinations work, but one option is Zanik and then Korasi/Jessica. Let Zanik keep watch and Korasi/Jessica to gather wood. You will need to gather 25 wood and metal. Once you have done this, head out towards the underworld bridge and build the battering ram. This will have no effect on gameplay. You will be fighting for the rest of the quest. Get your gear together and click on the war table. You will make a corny speech and then begin. Head in front of the battering ram. It will follow you. Your allies can be controlled by clicking their names on the ally menu and then clicking where you want them to be. Nomad will continue making a speech when you arrive towards the wall. Make sure his speech does not appear over your ability bar. Keeping the battering ram alive at this part is easy if you keep your allies ahead of it and kill anything before it gets within attack range. Continue the assault and you will eventually find yourself in the underworld fortress. Move the battering ram along the bridge. If you found the secret passage during the interrogation part, enter it through the east and you will be able to skip the battering ram fight. If not, move with the battering ram across the bridge. When the battering ram begins to hit the door, place most of your minions on the bridge. This will block the ascension members from getting to the ram and your minions should be able to take care of them. Kill the ascension members that appear around the ram yourself. You will encounter Nomad. He will show you his new "god" he has conjured up. Xenia, Death, and Icthlarin will agree to take on the god while you will take on Nomad. 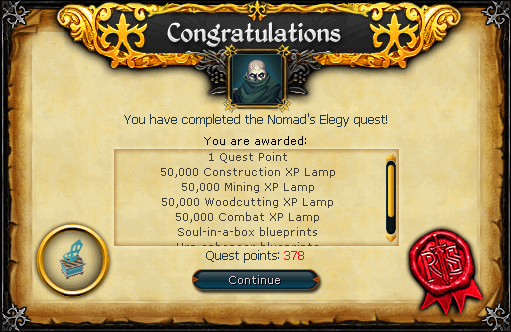 The first Nomad fight is not quite as difficult as the one in Nomad's Requiem but not easy going either. Nomad has two special attacks, one where he teleports you to a spot which is then attacked by the god. To avoid this, surge/run out of the way. 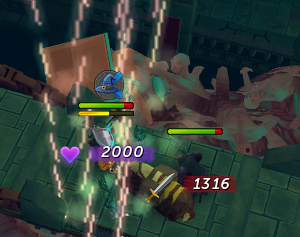 Putting on the protect from melee prayer will also reduce the damage from the construct to 1. His other attack involves what can be called "purple lightning," which will hit you for heavy damage if you are standing in it. You should see some lightning before it strikes you. Again, to avoid this run or surge out of the way. Nomad likes to run around. To punish him for this, try using some bleeds from time to time. Nomad attacks with typeless damage, so use soulsplit if you can. When you have killed Nomad, you will begin playing as Xenia. Xenia has basic attacks and three abilities which you will use to kill three walls of ascension creatures. To begin, creep up on a pack of ascension creatures. Spam the abilities that target the majority of ascension creatures attacking you (for example, use fire blast if you are being pelted by roarii). At the same, watch out for black spots. Black spots briefly appear then are hit with a fireball. If you are on or a square around the black spot, you will be hit for 1000 damage. When you have killed all but the capsarii, kill these. They do not have any abilities that you can use on them but you will heal from damaging them. Repeat for all three walls. Second verse! Same as the first! A little bit louder and a little bit worse! Same fight as before but this time, Nomad will have a "Feel my wrath" attack that will hit you for 7000-9000 damage, depending on how many maximum life points you have. This can be avoided by hiding behind a pillar. If you find that you cannot avoid the attack, you will have to eat up and bite the bullet. You may want to stick around a pillar in case you need to avoid Nomad's wrath. Death has to weaken the construct. Walk towards the middle of the path, directly face the construct, use the provoke ability, and then immediately shift 3-4 squares to the side. When you see the construct's hand, face the hand and use the scythe ability to grab a soul and then use the purple smoke ability to free the soul. The scythe ability does not work at the construct's wrist; you must use the scythe a few steps from the edge. Once you have done this, immediately high tail out of that area because rocks will begin falling. Do this for all four sides. And you're back in Nomad's grill! Nomad will have the same abilities as the last trial but will add a clone ability. At a certain stage he will clone himself and both Nomads will start fighting you. You have no option but to kill one of the clones and then continue the fight. A soul freeing face off! To start, run to the east (preferably using the minimap) and when you are near the congregation of souls in the corner, hit the staff ability to collect the souls. You should now see a blast following you - this is the construct's soul collection blast. If you are hit by it you are dead. Continue running, paying some attention to the blast, and collect the rest of the souls in the area. When you are done collecting souls, the blast should be immediately behind you. At this point turn on the shield. Nomad's dialogue can interfere with shield activation, so be careful. You will probably need to repeat this once more before moving onto the final Nomad fight. At the final rodeo, Nomad will attack with constant melee attacks. He will not use the wrath ability or summon help from the construct. Instead of using soul split, use protect from melee prayer. This should prevent you from getting KOed. Nevertheless, pay careful attention to your life points and the purple lightning attack. A cutscene will play out, where you will be asked if you want to spare or kill Nomad. Choose whatever option you wish. Following a goodbye to all of the underworld beings, Death will ask Zanik to guard the Soul Altar. You can prevent this from happening if you wish. Once you are done, the quest is completed. Both blueprints are for use with the invention skill. The urn blueprints will give 25% more experience when teleporting urns. The soul in a box blueprints will grant higher success when pickpocketing.